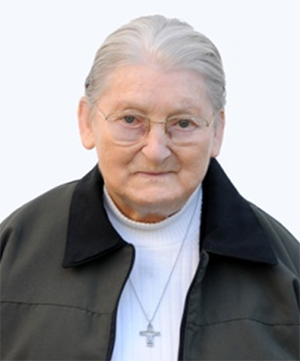 In the early morning of January 24, 2015, the Lord of life passed silently through the Klafke family and Our Lady of Aparecida Province, calling Sister Theonizia Maria to eternal joy. Born on October 4, 1929, Theonizia was the fifth of twelve children of João Egídio Klafke and Albertina Christina Frantz. 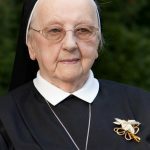 When she was 19 years old, she answered the call to religious life and entered the postulancy of the Sisters of Notre Dame in Passo Fundo. Three years later, her sister Irena Nayr (Sister M. da Paz) followed the same path. From a young age, she dedicated herself professionally to the noble mission of serving her brothers and sisters as an excellent cook. For 34 years, she administered the kitchen of the Clinic Olivé Leite, Pelotas, where she was loved and respected by both staff and doctors. She devoted special care to the Sisters who, in that time, used to have their vacation time at Laranjal, so that nothing would be lacking and so that they had a pleasant holiday. With the closing of the Clinic Olivé Leite in 2003 where she had dedicated herself entirely, she found difficulty in adapting herself to new communities and activities. She was a gifted woman in domestic skills, both in the kitchen and also in her knitting which she did with perfection. She cared for the vegetable garden and flower garden with special affection. She was happy to give and gift products which resulted from the work of her hands: fruits and cut flowers, culinary delicacies, or pieces of knitting which she made. Sister Theonizia Maria, the Gospel Martha, was always ready and attentive to serve, to welcome and to offer the best of herself. At the same time, she was the Martha of faith who believed in the resurrection when Jesus told her: “I am the resurrection and the life; he who believes in me will never die” John 11. 25-26. 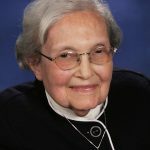 This living faith was shown through her fidelity in the following of Jesus in consecrated life, through the spirit of prayer and her sense of belonging to the Congregation. 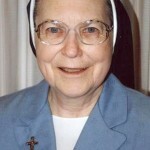 She nurtured a special devotion to Our Lady. 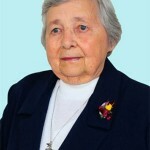 Sister Theonizia Maria liked to receive the visits of her relatives and was very happy when she still could visit them. Unable to visit them in the last years, she received with affection the visitors who came to her. She was a pleasant Sister, simple, available and silent, and her departure to eternity was silent and almost unnoticed. Only a slight moan was her last goodbye at 4:10 am on January 24, 2015, when the nurse made her rounds to attend to her personal needs. Her last community experience was at Recanto Aparecida, where she received the loving care of her co-Sisters and staff. May the Lord welcome her into eternal rest to fully enjoy life with Him whom she loved and to whom she devoted her life and mission.